Membranes, like this in the photo, are used to filter and treat previously unusable water so it is available to local communities. Title XVI projects provide opportunities for communities to recycle wastewater and treat water that was previously unusable. 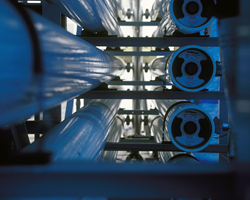 Bureau of Reclamation Commissioner Brenda Burman announced that Reclamation is awarding $35.3 million for six authorized Title XVI water reclamation and reuse projects in California. The funding will be used to improve flexibility during water shortages and diversify the water supply. "Title XVI projects provide opportunities for communities to recycle wastewater and treat water that was previously unusable," Commissioner Burman said. "It is a proven tool that enables communities to access dependable water supplies." Reclamation provides funding through the Title XVI Water Reclamation and Reuse Program for projects that reclaim and reuse municipal, industrial, domestic or agricultural wastewater and impaired ground or surface waters. Reclaimed water can be used for a variety of purposes, such as environmental restoration, fish and wildlife, groundwater recharge, municipal, domestic, industrial, agricultural, power generation or recreation. Learn more at http://www.usbr.gov/watersmart/title/.